Toll lanes around the Capital Beltway and I-270 in Maryland could be built in several separate phases and even operated by different companies under the latest plans released to industry insiders. WASHINGTON — Toll lanes around the Capital Beltway and I-270 in Maryland could be built in several separate phases and even operated by different companies under the latest plans released to industry insiders. It indicates Beltway construction could last for years. The first phase would include fixes for the Legion Bridge. A new document sent last week ahead of the next forum for private companies that could design, build and operate the lanes said that while Maryland eventually plans more than 70 miles of toll lanes from Frederick to Bethesda and from the Legion Bridge to near Oxon Hill, building out the entire network could take many years. In addition to the already disclosed deferral of any toll lane construction on Interstate 270 north of the Shady Grove Metro, the new documents indicate that the rest of the toll lanes would be divided into entirely separate phases that could be awarded to entirely separate contractors. To start, Maryland would only award a contract for toll lanes across a reconstructed or rehabilitated American Legion Bridge extending some to-be-determined distance into Maryland (Virginia is separately set to extend the 495 Express Lanes to just shy of the Legion Bridge to connect). The private company or companies that would design, build and operate Maryland’s toll lanes would remain responsible for the toll lanes maintenance and upkeep for 50 years, but would not be responsible for any maintenance of the Legion Bridge or the regular travel lanes. Overall, that first phase contract would be expected to cost $2 billion to $5 billion for construction and design, the Maryland document said. One potential bidder, Cintra and Ferrovial Agroman, suggested about a year ago that a segment over the Legion Bridge should include the proposed toll lanes up the I-270 spur to Shady Grove, with another segment for separate bids to cover the Beltway from the I-270 spur to U.S. 50 in Lanham. 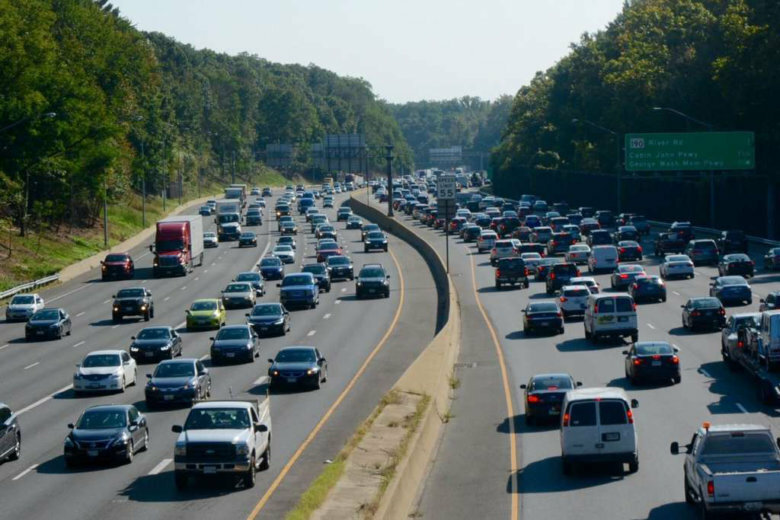 That private group, which is building the Interstate 66 toll lanes outside the Beltway in Virginia, believes those would be the most profitable segments, and toll lanes south of U.S. 50 past Branch Ave. near Joint Base Andrews would make less money. It is not yet clear whether that segment in Prince George’s County is the one Maryland plans to build last. Cutting the project into more pieces is meant to reduce the risk to private companies to lure more bids, and limit potential construction cost increases if there is heavy demand for materials all at once. The Interstate 66 toll lanes under construction outside the Beltway are about 22 miles, so dividing the Maryland project into four pieces would create similarly sized projects that would each likely also take four to five years each to build from the time a deal is finalized. Another company, Macquarie, suggested one of the biggest challenges in construction would be maintaining traffic flow on already congested highways. The toll lane plan as presented has faced opposition from a number of leaders in Prince George’s and Montgomery counties, who are concerned the push toward procurement while a federally-required environmental review meant to determine the best options for the corridor remains underway could push that review toward support of toll lanes. The early procurement documents acknowledge a chance of the review not supporting the toll lane plans, and say the process will stop in the event that happens. The chances of that reversal are remote though. Maryland is entirely focused on building toll lanes as part of the procurement. After some one-on-one meetings with the private companies Dec. 13 and 14, Maryland hopes to release a request for qualifications to companies in April for the construction around the Legion Bridge. Also around the same time next spring, Maryland plans to choose a preferred alternative for overall toll lane construction through the environmental review process. A separate study of the deferred toll lanes on Interstate 270 from Shady Grove to Frederick is now planned to begin next year. For the initial projects, Maryland’s stated goals are congestion relief when the project opens, minimized impacts when possible during four to five years of major construction on each segment, a split of toll payments with state or a single upfront payment to state and accelerated delivery. “In meeting MDOT’s goals, MDOT is looking for a partner with shockingly innovative approaches that will provide high value with a focus on ensuring excellent customer service to MDOT and the public,” the message to the industry said. An outline of the public-private partnership agreement would be released this winter, and the state’s Board of Public Works would approve the continuation of the procurement process in February. Final details of what the state is looking for in an initial project are now expected in early 2020, with bids due by summer 2020. Maryland hopes to select a winning bidder and close the deal by the end of 2020, which could allow construction to start on a first segment of toll lanes as soon as 2021. The contractor would likely get financing help from the state through federal low-interest loans and bonding support. The state is working now to complete and compile surveys of land topography, utility layouts, pavement information, rights of way, records, traffic models and tolling revenue studies. For separate toll lanes on Interstate 95 north of Baltimore, the Board of Public Works just approved a $90 million increase in architectural and engineering contract costs for the already $1.1 billion 95 Express Toll Lanes extension. That construction is due to start next year, and be completed in 2026. Unlike the Virginia Express Lanes, those lanes north of Baltimore charge tolls to all users, even carpools. Maryland has not yet committed to what the policy would be for the toll lanes on the Beltway and I-270.